In Peace River, Parks and Recreation are under the auspices of the Community Services Department. With 17 km of paved walking trails and 80.9 hectares of green space there is a lot to oversee and maintain. The department handles all season activity focusing on the three major facilities the Baytex Energy Centre, Athabasca Hall, and the Peace Regional Pool. In the winter months this also includes two sliding hills, five outdoor hockey rinks and two skating area. In summer that attention turns to the five fastball/slo-pitch diamonds, two baseball diamonds, two soccer pitches, two football fields, two tennis courts, 4 pickleball courts, 13 playgrounds, two larger parks (12 Foot Davis and Riverfront Park), as well as an off-leash dog park and a water play park. 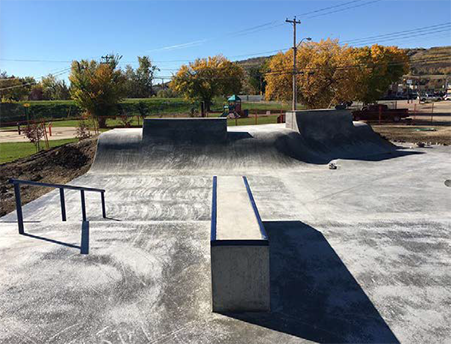 New to the responsibilities is the operation and maintenance of the downtown skateboard park and skateboard area in Shaftesbury. It might be cold but playing outside can still be a lot of fun. Snow makes the playground into a winter wonderland that can be even more exciting. Playground safety is always important, but in the winter months there are some extra precautions everyone should take. Check the surface around the playground structures. Some surfaces designed to keep kids safe in the summer freeze hard in the cold, and don’t protect from falls as well. The snow might be beautiful, but it can also hide hazards. Look for bottles, sticks, rocks and more hidden under snow. Winter clothing is important to protect from the weather, but scarves, boot laces and drawstrings can get caught on playground equipment and cause strangulation or other injuries. Make sure anything loose or dangling is tucked in and consider a neck warmer instead of a scarf. Winter can be just a fun as summer and being outside at any time of year is a great way to improve physical and mental health, just remember to take a few extra steps to stay safe! 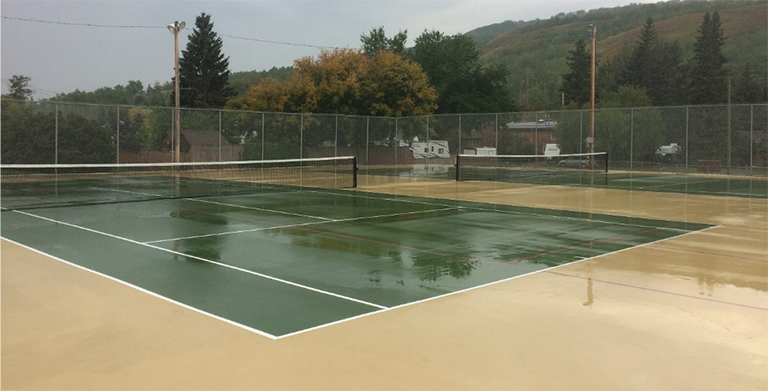 Tennis and Pickle Ball Courts in Lower West Peace near 91 St and 111 Ave. The Curtis Marshall Skate Park Located Downtown next to the Legion and the Spray Park..
Each spring, the Community Services Department’s focus swings to spring flowers, grass cutting and parks and playground management. Each year, local greenhouses are asked to bid for the contract to have their flowers featured at locations throughout our beautiful community. 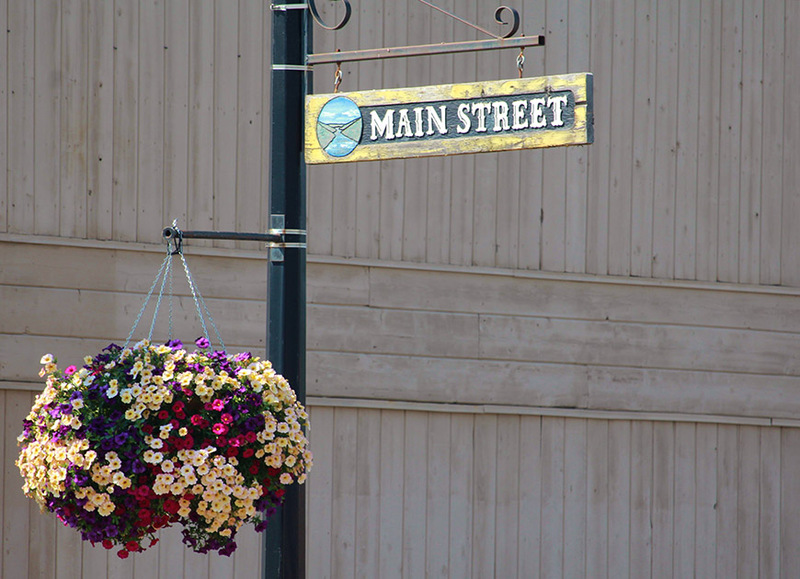 From the flower planters down Main Street, to the hanging baskets and garden plots at our Town-owned facilities, you will notice brightly coloured flowers and grasses. There are over 7,000 bedding plants planted each spring and 65 hanging flowerbaskets.